Does the world need another show of Impressionist or Postimpressionist paintings? A pretty good case can be made that the answer is no. But “Impressionists on the Water,” at the Legion of Honor Museum in San Francisco, leaves me wondering if we’ve spoken too soon. The show has a laid-back summer buzz. It’s brisk and succinct. It tells a significant story. And there are extraordinary paintings by Monet, Renoir, Pissarro, Seurat, and others. These nineteenth-century artists brought an almost scientific attention to the study of nature. And what they found was that the closer they looked at the world, the stranger the world became. For painters, water could become the ultimate conundrum, both visible and nearly invisible, a sight that confounds sight. All of us experience water palpably, immediately—and that’s very much a theme in “Impressionists on the Water.” But the show also features water as the stuff of dreams and fantasies, suggesting womb-like immersion or journeys across storm-tossed seas. The exhibition is almost overwhelmingly suggestive. It also happens to be mounted in one of the more beautiful museums in the world, the Legion of Honor, part of what is known collectively as the Fine Arts Museums of San Francisco. And when you walk out of the Legion of Honor you are in the midst of some absolutely ravishing scenery, with vistas of the Golden Gate Bridge, San Francisco Bay, and the Pacific Ocean. Impressions of water abound. If the easygoing authority of “Impressionist on the Water” comes as a surprise, this is at least in part because by now almost everybody finds something risible about the museum world’s never-ending attempts to dream up another Impressionist or Postimpressionist show and put a few more Monets, Renoirs, or van Goghs on the wall. Of course curators are in a bind, because the Impressionists and Postimpressionists are surefire box office, and therefore unavoidable. So the thematic games continue, and we have “Renoir Landscapes,” “Renoir, Impressionism and Full-Length Painting,” “Renoir and Algeria,” “Van Gogh: Up Close,” “Van Gogh Face to Face,” and that is not even the beginning. Although the paintings can astonish us, the shows have a way of becoming all too predictable; the canvases look exhausted or pumped up, like athletes past their prime forced to compete once too often. Many people were fascinated by “Impressionism, Fashion, and Modernity,” which was at the Metropolitan Museum of Art over the winter and is now at the Art Institute of Chicago, but I found the show awfully strained. The juxtaposition of nineteenth-century masterworks with dresses and fashion illustrations struck me as simultaneously erudite and gimmicky. The paintings had been manhandled; they’d become mere illustrations in an intricate thesis. It was the classics under new sponsorship—the Impressionists not as avant-gardists but as fashionistas. What makes “Impressionists on the Water” a success is the confidence with which the curators stay inside the story they’re telling, keeping the plot line simple enough that the paintings emerge with their subtlety and complexity intact. Curating shows in a major museum involves both close calculation and bold, heartfelt feeling. Scholars need to find a middle ground, using their own highly specialized knowledge to create exhibitions that make sense for a broad public without condescending to the public or parading the curator’s erudition. When an exhibition features artists and subject matter as familiar as what we have in “Impressionists on the Water,” curators need to develop a special kind of relationship with the audience, going easy without soft-pedaling the material. That’s what I feel here. (The show was put together by three guest curators: Phillip Dennis Cate, Daniel Charles, and Christopher Lloyd; it travels to the Peabody Essex Museum in Salem in the fall.) Even the inclusion of an actual boat—a sleek wooden cruising gig of a kind with which the artists were well acquainted—is wonderfully intelligent. 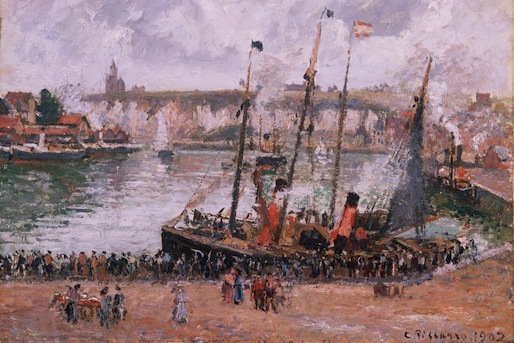 Coming at the very beginning of the show, the elegance of the vessel, which may have been owned by the novelist Émile Zola, almost literally transports us into the natural world that’s revealed in the next few galleries. Some art historians will find this show simpleminded, arguing that everybody knows that the challenge of painting water was critical to the Impressionists’ evolving explorations. That’s not untrue. But it’s too often forgotten that an exhibition in a museum is not the same as an argument in a scholarly book. An overly complicated theme can undermine the experience of the art, turning galleries into lecture halls. Museumgoers will have no trouble relating to canvases in which Monet and Renoir catch forever the easygoing conviviality of sun-splashed nineteenth-century afternoons passed on sparkling lakes and rivers. Monet is at his most youthful and agile in these paintings of the 1870s. His brushwork is utterly unpredictable, as he lets loose with a seismographic record of pure visual sensation. 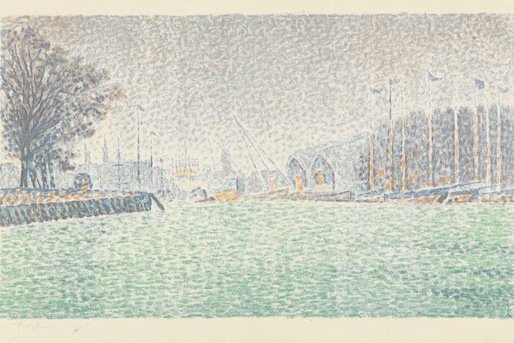 Later on in the show, with Seurat’s beautiful study of the harbor at Honfleur, water is not so much a palpable substance as it is a symbol of all that is infinite and unknowable, with boats fading into the water that fades into the sky. In the final gallery of “Impressionists on the Water,” naturalism has given way to symbolism, and water’s boundlessness is nothing less than an reflection of the boundlessness of the human imagination. Some may find themselves thinking of Debussy’s La Mer, or the “riverrun, past Eve and Adam’s” with which Joyce’s Finnegans Wake begins. If such associations are barely suggested in “Impressionists on the Water,” that is perfectly fine. A museum-going experience should be suggestive rather than insistent. In the end, it’s the painting not the thesis that counts. In some of the very last works in the show, the focus is on men and women who are embarking on mysterious voyages. The question is no longer what water looks like or feels like but where it can take us.